HALIFAX -- They first started appearing along Canada's East Coast about 10 years ago: towering Christmas trees fashioned out of carefully stacked lobster traps. 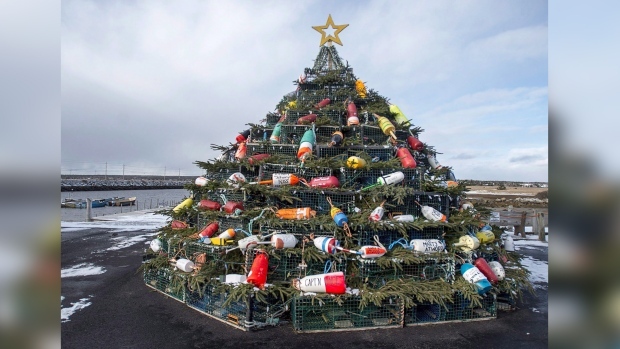 Adorned with colourful buoys, twinkling lights and evergreen boughs, they are becoming regular fixtures in fishing communities across Atlantic Canada. "They are popping up everywhere," says Suzy Atwood, tourism development officer for Barrington, N.S., which assembled one of the region's first trap trees in 2009. "It speaks to the importance (of lobster fishing) to our economy ... It's the backbone of our community." Barrington, on Nova Scotia's southwest coast, bills itself as the "Lobster Capital of Canada." About 40 per cent of the country's lobster harvest comes from the area. Last Sunday, about 150 people gathered for the lighting of the lobster trap tree, which took place near the windswept causeway to Cape Sable Island. Barrington's five-metre tree is made from about 200 rectangular, metal traps -- often referred to as lobster pots -- retrieved from the local landfill. It is festooned with 180 wooden and plastic buoys, each painted in a pattern unique to each fishing boat. Many of the colourful markers are inscribed with the names of fishermen lost at sea. "I'm reminded every year that as each of the buoys is put on the tree, they can bring heartache and sadness to the community," says Atwood. "But it's the reality of fishing in Nova Scotia." A white, wooden buoy that was added to the tree this year pays tribute to local fisherman Stillman Quinlan and his nephew James Smith, who both died on Nov. 30, 1964 -- opening day of the fall lobster season -- when their boat, "Jane and Judy," sank in rough weather. Rescue attempts by local fishermen were thwarted by strong winds. The tragedy prompted residents of southwestern Nova Scotia to persuade the Canadian Coast Guard to permanently station a rescue boat at Clark's Harbour in 1966. Other buoys on the tree include the names of local fishermen who have passed away, as well as those who will be away from home during the holiday season because they are busy hauling in traps offshore. "It's heartwarming, but it's heart-wrenching at the same time," says Atwood. "But a lot of families have told me that they find a lot of comfort in the tree." And the colourful memorials aren't just for locals. 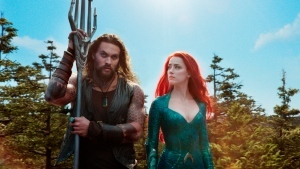 Atwood says she recently received a call from a man from Cape Breton who asked if a buoy could be placed on the tree for his son, a fisherman lost off the coast of Newfoundland. Atwood said she used a spare buoy to grant his request. Over the years, other Nova Scotia communities have joined the tradition, including Lunenburg, Port Mouton and Musquodoboit Harbour, which has a small lighthouse atop its tree. Similar trees have appeared in Garnish in southern Newfoundland and Tignish, P.E.I., where the tree is made from traditional wooden traps. It's believed the tradition started in 2001 in the historic fishing port of Gloucester, Mass., and has since spread to several seafaring communities in New England. A trap tree in Rockland, Maine -- home to the Maine Lobster Festival -- is built with custom-made traps and is one of the tallest around. Standing about 12 metres, it is topped by a giant fibreglass lobster lifting its claws to the sky. Rockland describes itself as the "Lobster Capital of the World," but so does Shediac, N.B. Atwood says the coastal town of Plymouth, Mass., donated a buoy to be displayed on the tree in Barrington, and the Nova Scotia town responded by sending a buoy to be displayed on the Plymouth tree. "That's what's so great about the tree," she says. "It's all of the stories that it tells."